I love breakfast food. When presented with the option to order breakfast at a restaurant, I usually take it no matter what time it is. It really isn't fair that breakfast gets hurried over, rushed, and forgotten about so often. In our house we have breakfast for dinner (or lunch) at least once a week. No need to relegate breakfast foods to the morning! For the past few months I've been making recipes from a new cookbook called Breakfast for Dinner by Lindsay Landis and Taylor Hackbarth. They write about their culinary adventures on the blog Love and Olive Oil. I received a review copy of their book from Quirk Books and from the moment I opened it I was excited to get cooking. Breakfast can be savory or sweet and I have a preference for the savory side. Because the recipes are geared for dinner, this book includes many savory recipes. I immediately picked a few to try - three the first week I had the book and quite a few since! The recipes I have tried have been easy to follow and most importantly result in delicious dishes. My test for whether or not I would by a cookbook is how many recipes I would realistically make. With the exception of foods we don't cook at our house (shellfish and pork) we would eat almost all of the other recipes in this book. And the pictures are so nice that I find myself flipping through the book while I sit on the couch (although it does make me really hungry). I love biscuits, fried chicken, and waffles. This is a perfect combination of all three. I keep mixing up the sides and toppings for this one. First way: side of spicy apple sauce, and salad with lemon-honey dressing. Second way: drizzled with habanero-infused maple syrup and a side of sauteed apples with cinnamon. With a base of chicken and biscuit waffles, the topping combinations are really endless! Bonus? 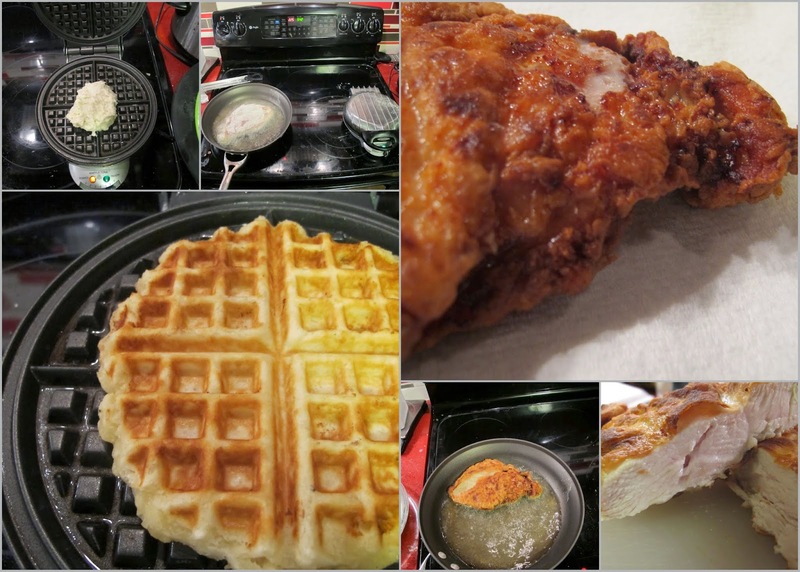 This fried chicken method means delicious fried chicken anytime - with or without the waffles! Same for biscuit waffles, when the craving hits I am now ready! With a few bananas and a bundt pan, you can turn out a decadent dessert treat. This recipe uses my favorite flavor combination of chocolate and bananas. For an extra sweet twist, I made the glaze using chocolate peanut butter (plus, somehow no chocolate chips on hand). Just like the authors' family recipe, my Aunt Patti's banana bread is always full of chocolate chips. This won't replace hers as a favorite but I can report that this cake did not stick around very long at our house. The idea of the Monte Cristo has always intrigued me. However I've only encountered them with ham. I was excited to find a recipe for a Monte Cristo that I would eat. Who wouldn't love a sandwich with creamy goat cheese, pepper jelly, and roasted turkey? I decided to make this on a whim and didn't have all the ingredients that the recipe called for but this was still great! We sandwiched fig jam, turkey and goat cheese between slices of whole wheat bread and cooked it up according to the recipe. The result was a flavorful take on the Monte Cristo! All three recipes were kid-approved by our resident 2 year-old diner. Our little taste tester now gets excited when the waffle maker comes out - even if he calls them "awfuls" half the time. And even though he ate the sandwich in his own unique was as shown below, I know he liked it! I received a complementary copy of this book for review. I was not obligated to post and received no other compensation. My love of chicken and waffles and banana, chocolate, and peanut butter is real and honest. Ask anyone who knows me! I've made the chicken and biscuit waffles a few times too. That's such a great recipe!